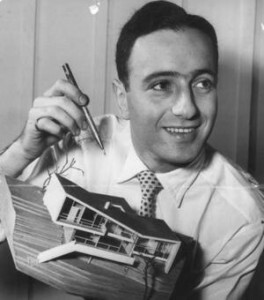 Harry Seidler with a late 1940s house model. Harry Seidler and Douglas Snelling were both in Los Angeles (separately) in 1948, before opening their architectural practices in Sydney later that year. Although both Seidler and Snelling were born in what is now the European Community, they arrived in Australia via different backgrounds and paths. Seidler had been highly educated in Vienna, at Canada's University of Manitoba and Harvard, and through internships with great US modernists Marcel Breuer and Oscar Niemeyer. Snelling was entirely self-taught in graphics and exhibition, interior and furniture design. In 1948, Snelling began to study at home for an architecture degree, while taking commissions from clients for built and unbuilt houses for north shore sites. He won his architecture degree and registration to practice in the early 1950s. Books on Seidler's career, by Sydney writers Philip Drew and Helen O'Neill, have recorded a comment that when he came to Sydney he was friendly with three other 'kindred spirits' among local architects: Sydney Ancher, Arthur Baldwinson and Douglas Snelling. All three local practitioners were older than Seidler -- Snelling, the youngest, being eight years older than the Austrian. Ancher and Baldwinson both were pursuing authentic Australian (bush environment-responsive) approaches to their architecture. From 1948 until the early 1950s, Snelling was Sydney's main young exponent of Frank Lloyd Wright's organic architectural strategies: this placed him opposite Seidler in the then-peaking international 'Battle of the Styles' (between post-war followers of the then-elderly Wright and several generations of younger Europe-born interpreters). By the mid 1950s, Snelling also was competing with a younger generation of Wright acolytes: notably Peter Muller (also with United States work experience) and cousins Neville Gruzman and Bruce Rickard. During those years, the concept of Snelling and Seidler as 'kindred spirits' evaporated – probably when Seidler usurped Snelling as the RAIA's choice for the coveted role of designing the House of the Future exhibition in Sydney in 1954. Baldwinson, heading the selection panel, had recommended Snelling, but Seidler was finally announced. Seidler cemented his stature by organising the legendary Euro-American modernist Walter Gropius to lecture in Sydney during the exhibition. Although Snelling was an enthusiastic new member of the RAIA at this time, he never later entered the Institute's Awards and was by the late 1950s a 'whinger' (to his senior employees at least) about its leaders failing to approve him. If Snelling had been allowed to organise the House of the Future show, might he have persuaded Frank Lloyd Wright to come to Sydney to lecture? A hypothetical query – but if so, that coup would have boosted Snelling's credibility. Since Seidler's death in 2006, his widow and architectural partner, Penelope, has been encouraging a new generation of (R)AIA leaders to help block recognition of Snelling – and senior staff at several Sydney cultural institutions say they are reluctant to exhibit Snelling because they receive financial contributions from the Seidler family. Penelope Seidler also has spent a reported $A5 million on building a new 'Harry's Park' on land beside the Seidlers' office and apartment building at 2 Glen Street, North Sydney. This widely applauded development has potential to muffle widespread criticism of her late husband for promoting a vision of architects designing buildings to transcend rather than integrate with nature. Snelling was a practitioner of Frank Lloyd Wright's organic architecture (nature integration) principles – which Seidler used to reject as being passé.